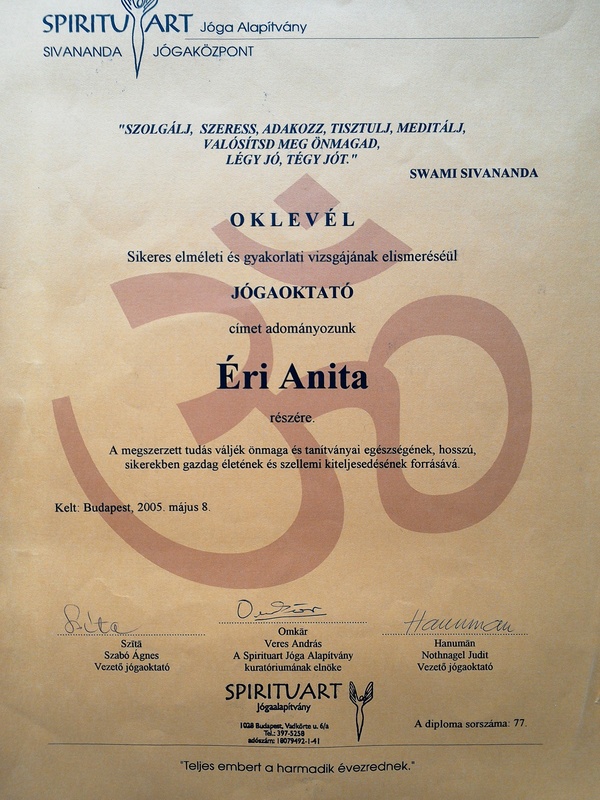 I'm Anita Eri from Hungary, Sivananda Yoga instructor. I get in 2005 my diploma of Yoga Instructor in the Sivananda Yoga Center of Hungary, took over the preceding years, the Postgraduate Institute of Medical exam success too health and natural healing modules. Acquired further expanded my knowledge of the Sivananda Center: raja yoga, meditation and advanced courses, while simultaneously studying in the School "Gate of Dharma" Buddhist philosophy course on religion, i get especially Zen Buddhism and Zen meditation. There I met with my Love, who is my Teacher, my Master and my Religion too. In 2007 our first son born, in 2009 our little girl, in 2013 our second son and in 2016 third son born. While studying at the college suspended the arrival of children, I continued my education in yoga courses extended specifically for expectant mothers in the Ashram Yoga Center, in the Anahita Yoga Center, and in the Sivananda Yoga Center. Mostly beginner and intermediate yoga classes, maternity yoga classes, yoga and general sessions with theories in a practical accessories.